According to statistics, more than 500,000 accidents involving semi-trucks occur each year in the United States. The Centers for Disease Control and Prevention reports that nearly 4.2 percent of all drivers who responded to a survey admitted that they had fallen asleep while behind the wheel at least once in the month before the phone survey. Although driver fatigue can cause devastating consequences regardless of the circumstances, the injuries and damages that follow a semi truck collision can be even more catastrophic. Additionally, the FMCSA allows drivers to work up to 70 hours each week if they travel seven days per week. Once a semi truck driver is off duty for 34 consecutive hours, then the 70-hour week can begin again. Drivers who are not required by their employers to travel seven days per week may still travel 60 hours in any given seven-day period, but the 34-hour rule still applies. FMCSA rules also mandate that a driver must take at least a 30-minute break for every eight hours that he or she is on the road, and he or she is not legally allowed to drive for more than 11 hours in one day. If a driver works for the maximum allotted period, then he or she is required to take two nights off and rest or sleep between the hours of 1:00 a.m. and 5:00 a.m. The FCSA regulations are intended to prevent truck drivers from operating their rigs while they are fatigued. Unfortunately, not all semi truck drivers and their employers comply with these rules. As a result, when a semi truck driver operates a vehicle for too long without a break, the driver’s cognitive function can be adversely affected. His concentration can wane and his response time can begin to slow down. In fact, studies show that a driver who travels for an extended period can become just as impaired and dangerous as someone who is driving under the influence of drugs or alcohol. 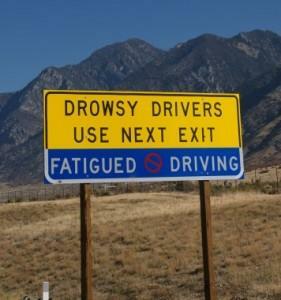 Additionally, if a driver falls asleep behind the wheel, the risk of catastrophic consequences increases. A sleeping driver could potentially cause a high-speed accident or a head-on collision even if he closes his eyes for a moment. If an accident occurs due to driver fatigue and it can be proven that the driver fell asleep or did not take the required breaks as mandated by law, the victim may be entitled to seek legal counsel from an experienced Georgia drowsy driver truck accident attorney in an attempt to recover damages for emotional distress, injuries, lost wages, pain, and suffering. If you or a loved one was involved in a semi truck accident and you feel that a sleeping or fatigued driver was to blame, you may be entitled to take legal action. The attorneys at Van Sant Law, can review your case, free of charge, and help you to determine if you have a case. Fill out our free, no obligation online contact form, or call us today at (404) 991-5950 to take the first step in pursuing a claim against the appropriate party.